Police in Delaware claimed their "fear" allows them to violate the rights of innocent people, a disturbing notion indeed. Delaware — In the ostensible land of the free, police are required to obtain consent, a warrant, or have probable cause that a crime is being committed before they can search you or your property. This ostensible right is guaranteed under the 4th amendment to the Constitution. However, police—who swear an oath to uphold the Constitution—routinely violate that oath and do so in the most egregious of ways. In the video below, Delaware state police are seen on video harassing an innocent black man, violating his rights by illegally searching his vehicle, and then sending him on his way as if he’s supposed to accept that this is the way things are. 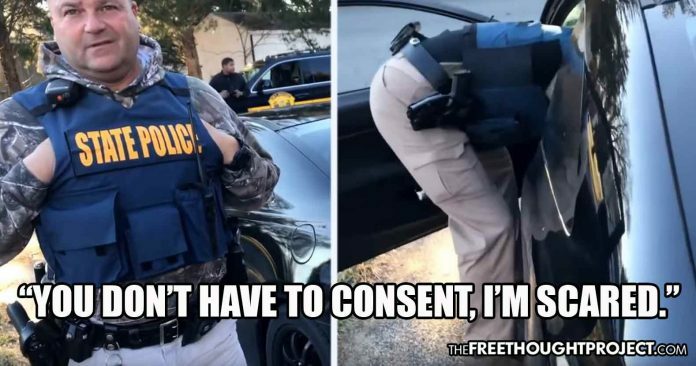 When he asks why his rights are being violated and noted that he didn’t consent to the illegal search, the cops told him that he doesn’t have to consent if they are scared—a disturbing notion indeed. The man who posted the video below remains unnamed. He posted the video to YouTube to expose what he calls racial profiling. And, his video is nothing short of infuriating. After one of the troopers comes up from the car, the man asks why they searched his vehicle without his consent and the response was utterly ridiculous. “You don’t have to (consent) I’m scared. You’re suspicious. You have Jersey tags and you’re in this area,” says the rights violating cop. And just like that, these officers had stopped an innocent man, trampled his rights, refused to identify themselves, and then left him like some scene out of 1930’s Germany. The man who posted the video wrote the following caption, asking if he should pursue a complaint against the cops in the video. The video certainly shows a violation of this man’s rights. However, police routinely violate the rights of innocent citizens and get away with it—even when it is captured on video. No other information has since been released in regard to this case. When police can claim their fear allows them to violate the rights of innocent citizens, something has gone terribly wrong. Police officer “fear” is a dangerous aspect to law enforcement in America today. While cop fear was used to justify an illegal search of a man’s vehicle in the video above, it is all too often the reason given to inflict harm and even death. As TFTP previously reported, a cop in Tennessee claimed that an 81-year-old woman caused him to fear for his life while she was gardening—so he tasered her. The family of Beunos Erwin has now hired an attorney after police showed up to their home responding to a 911 call for help and ended up tasering the very old woman in the street. The sheriff said he supports his deputy’s decision because the officer was forced to think fast and only had 14 seconds to decide what to do. According to Greene County Sheriff Pat Hankins, the deputy’s only options were to kill the woman or take a chance risking his life. Naturally, bravery was out of the question—apparently, so was walking backward. A police officer deploying a taser on a harmless 81-year-old woman illustrates the ominous training of police departments today. Do not be brave, do not risk injury, swiftly and immediately escalate force to avoid having to employ any heroic action to help an 81-year-old woman with dementia—god forbid you take a tiny risk to remove a rake from an elderly woman—or allow an innocent black man to travel without stopping him. After all, when your only tool is a hammer—everything starts looking like a nail.